FDs are most traditional form of investment offered by banks and other financial institution. In FD, you can park your money with bank and earn interest rates on their saving from the bankers. In the wake of RBI rate cut, private lender Axis Bank has revised its fixed deposit interest rates from Tuesday onward. Not only general category, but also senior citizens and NRIs will see change in their deposits made with Axis Bank. FDs are most traditional form of investment offered by banks and other financial institutions. FDs allow you to park your money with bank and earn interest rates on savings. 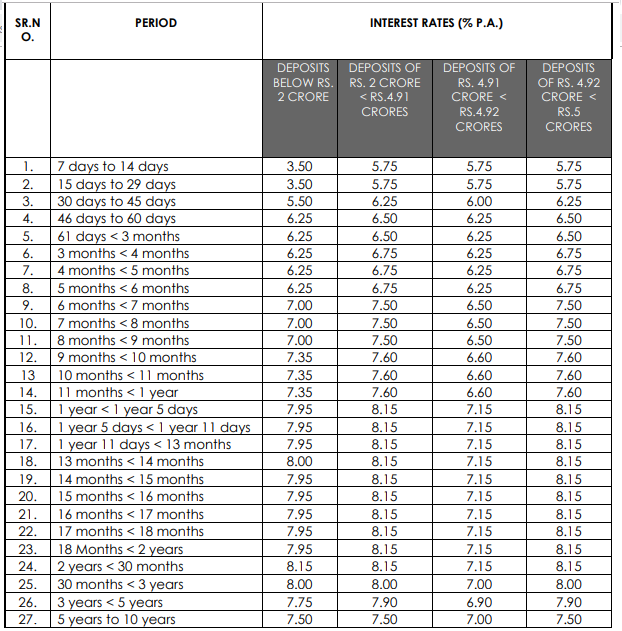 FDs in banks are generally done for tenures between 7 days to maximum 10 years. Now Axis Bank has revised interest rates for FDs made below Rs 2 crore, between Rs 2 crore to Rs 5 crore and above with immediate effect. Let’s check out new interest rates given by Axis. Below Rs 2 crore FD, a 7.30% interest rate each is given on tenures like 1 year < 1 year 5 days; 1 year 5 days < 1 year 11 days; 1 year 11 days < 13 months; 14 months < 15 months; 15 months < 16 months; 16 months < 17 months; 17 months < 18 months and 18 Months < 2 years. Interestingly, a 7.35% rate is given on 13 months < 14 months tenure. 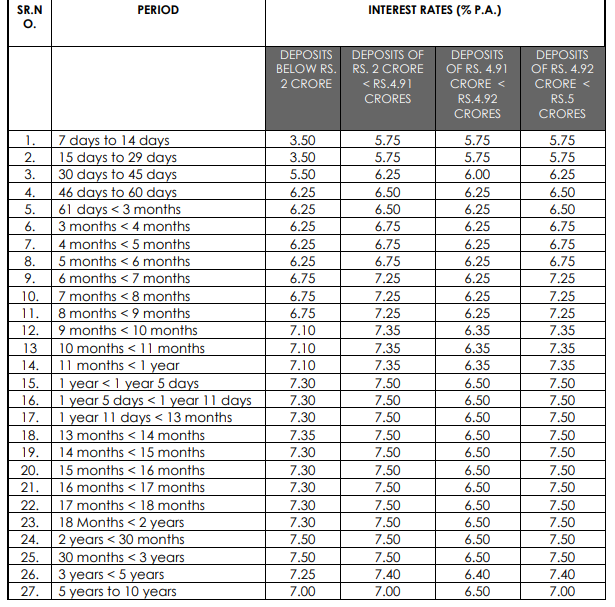 The highest interest rate here is 7.50% which is given each on tenures like 2 years < 30 months and 30 months < 3 years. Above 3 years to 5 years and 5 years to 10 years, a customer will enjoy 7.25% and 7% rate respectively. Below 1 year, a customer will get between 3.50% to 7.10% on their deposits. Generally, senior citizens enjoy much higher interest rates compared to others. A 7.95% rate each is given on tenures between 1 year to less 13 months and between 14 months to less 2 years. However, 8% interest rate is enjoyed on tenure like 13 months < 14 months and 30 months < 3 years. Highest interest rate for this category is set at 8.15% which is given on FDs below Rs 2 crore for 2 years < 30 months tenure. Apart from this, 3 years but less than 5 years and 5 years up to 10 years tenure, a senior citizen will get 7.75% and 7.50% interest rates on their deposits. From 7 days to less than 1 year tenure, the interest rate is ranges lowest to 3.50% and maximum 7.35%. Just like general category, the Axis Bank NRI customer enjoys similar interest rates for FDs below Rs 2 crore. However, the higher your FD value and tenure, the higher will be your interest rates. Axis Bank has asked its customer, to visit bank branches for further details in regards to deposits.